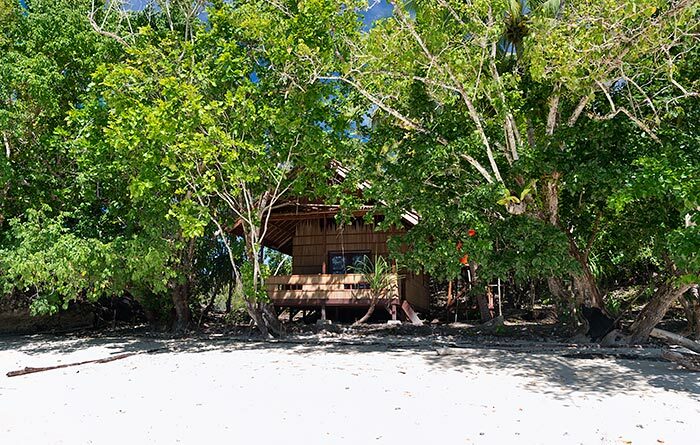 Private island, private beach, private bungalow. 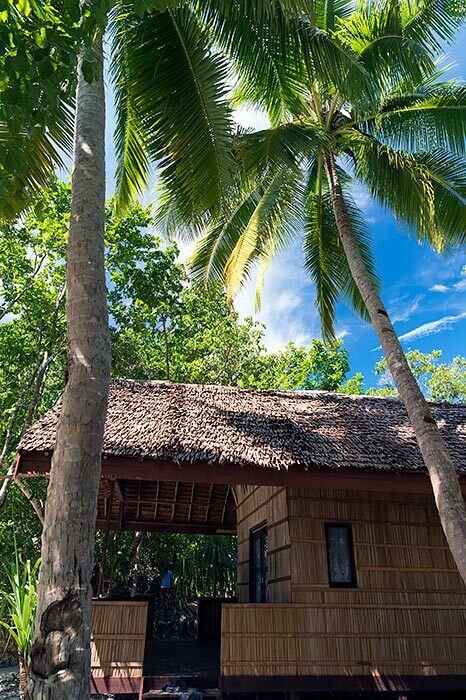 This spacious, deluxe bungalow provides a perfect escape to Kabui Bay splendour for couples or a family. 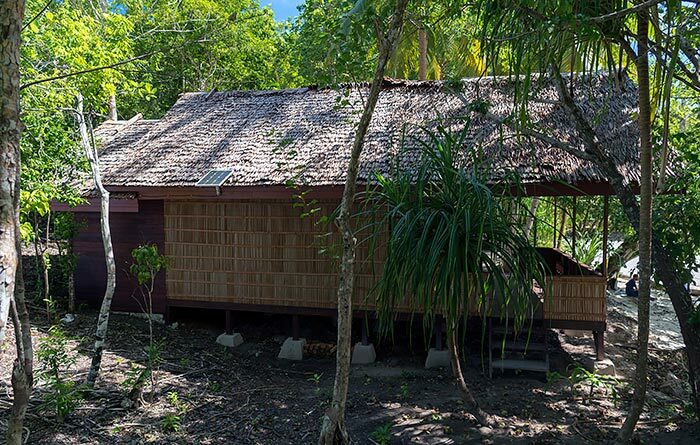 The most luxurious style of homestay bungalow. Large, with real bed, wardrobe, fan, solar power, comfortable furniture and an ensuite bathroom, Sleeps max. 2 persons / room. 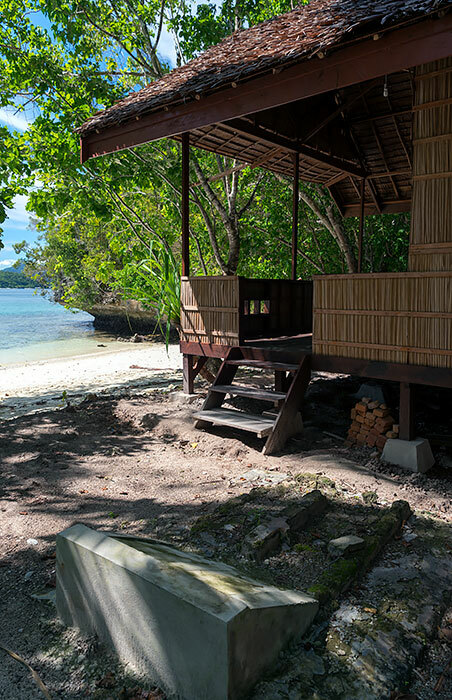 Hidden in the jungle’s shade, behind a curve of bright sand on an islet in Kabui Bay, Yensrai Star Homestay is a luxurious private retreat close to the eastern shore of Gam Island. 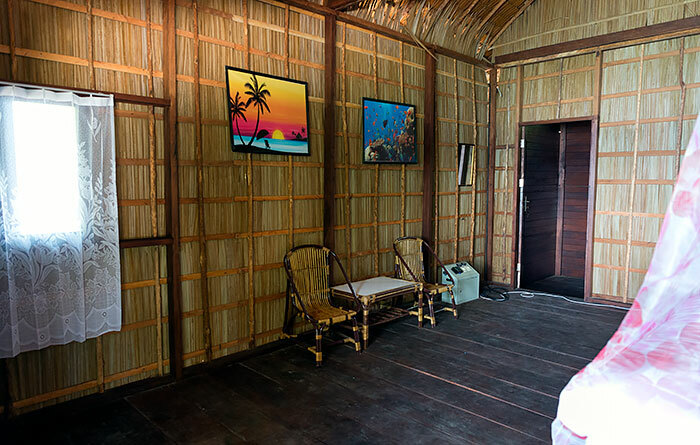 Yensrai Star Homestay is a single, large VVIP bungalow with a real bed, ensuite bathroom, a lockable wardrobe and chest of drawers and comfortable furniture. 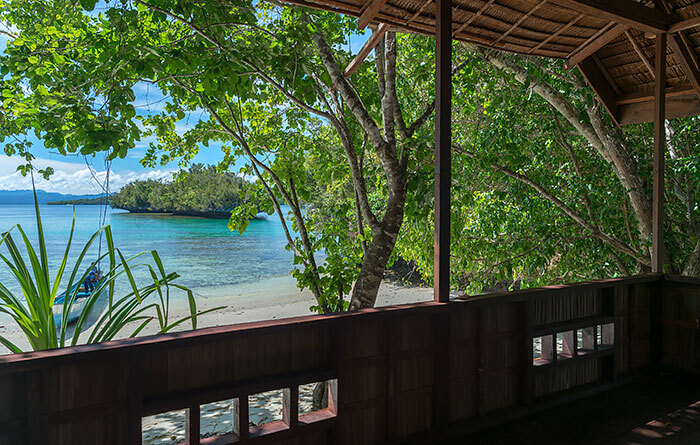 The bungalow is spacious and cool, has glass windows and doors that can also be locked, and a large verandah with views over the private beach to the blue of Kabui Bay. 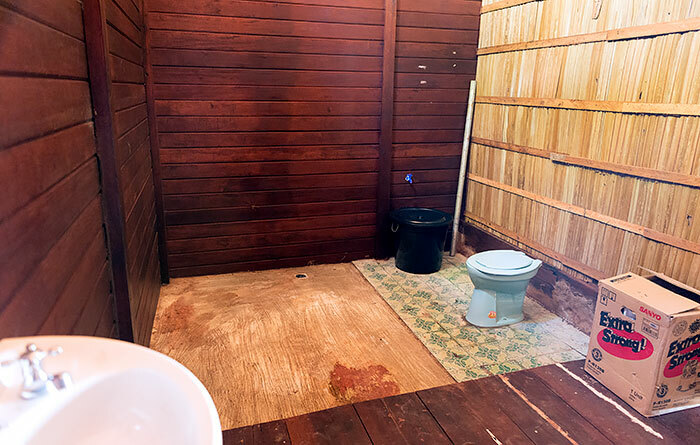 The ensuite bathroom has running water, a handbasin and western style toilet and bucket bathing. Meals are served on the bungalow verandah. 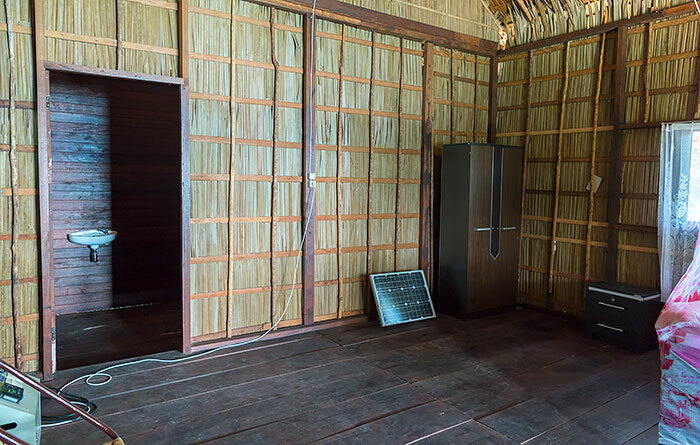 Electricity is provided by solar panels, with a 500VA inverter providing two international outlets of mains power. A generator provides backup power. 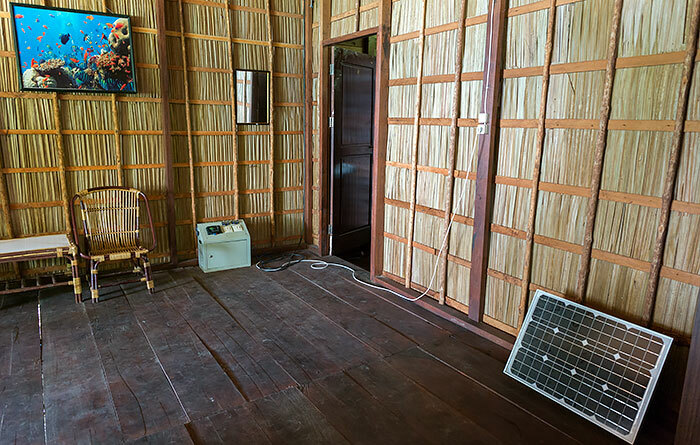 There was only a weak phone signal and no data connection available at Yensrai Star Homestay when we visited in June 2017. 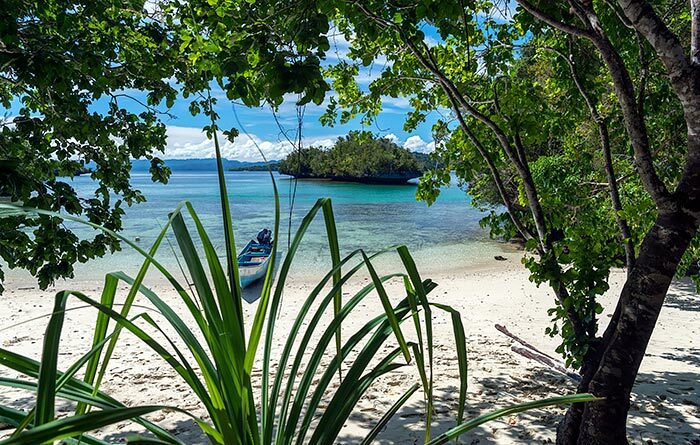 The nearest villages to Yensrai Star Homestay are Saporkren on Waigeo and Yenbeser on Gam, both of which are about a ten minute boat ride away. Only basic supplies can be purchased at village shops, so bring anything you consider essential with you. 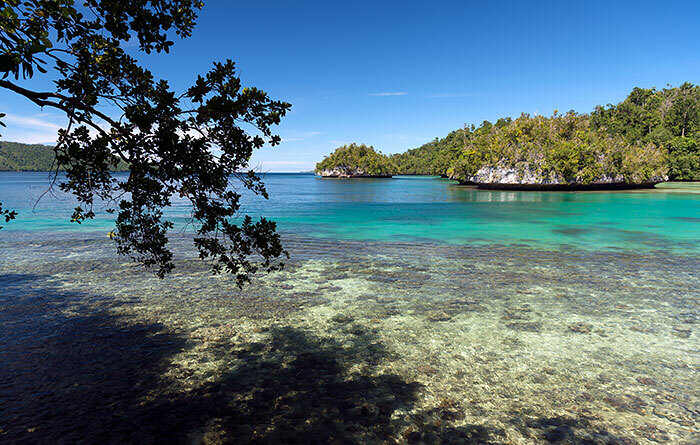 Please do take all the inorganic rubbish you create away with you, as there’s no environmentally sound waste disposal in Raja Ampat. Leaving plastic waste and dead batteries etc at Yensrai will only contribute to the trashing of paradise. English isn’t spoken at Yensrai Star Homestay, so if you don’t speak Bahasa Indonesia, bringing a phrasebook is a good idea. Yensrai hadn’t yet finalised its plans for Waisai transport when we visited in June 2017, but prices should be similar to those of other nearby homestays. Expect to pay around IDR 500,000 (shared by passengers) each way between Yensrai Star Homestay and Waisai. 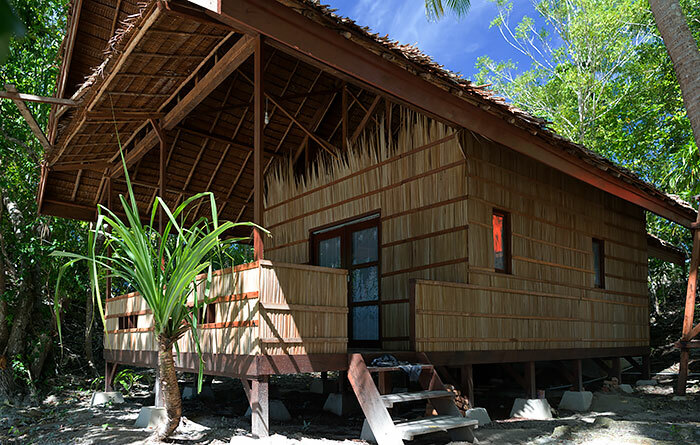 Yensrai Star homestay is close to the attractions of both Waigeo and Gam islands and snorkelling and sightseeing trips can be arranged as required. Both Wilson’s and Red Birds of Paradise can be seen near Saporkren on Waigeo. 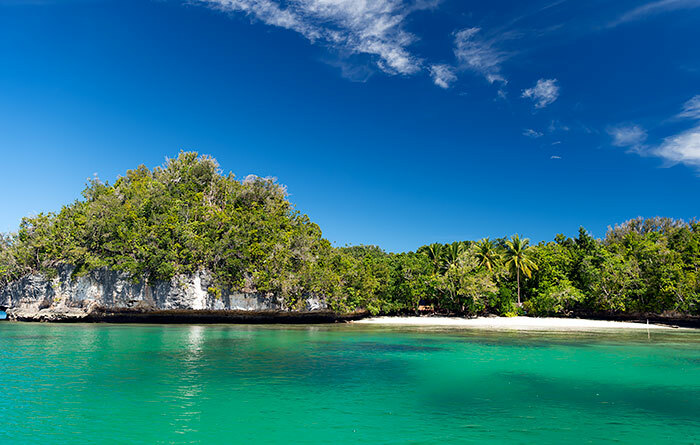 Kabui Bay’s orchid covered karst islands surround the homestay and Kabui Passage and the northern reaches of the bay are close by. 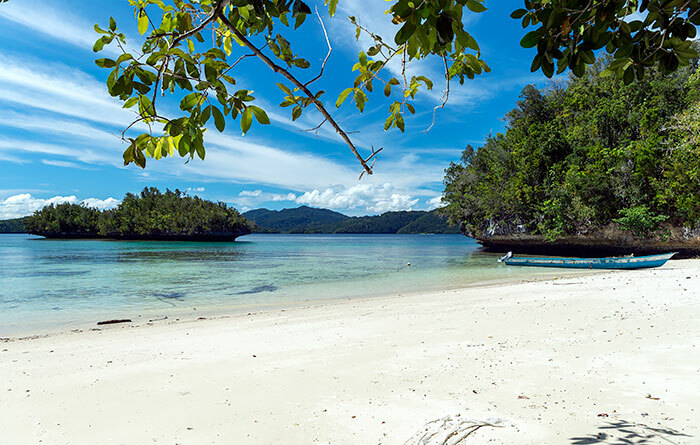 Inland ‘secret’ lakes and lagoons and great snorkeling at Batu Lima are very close by. 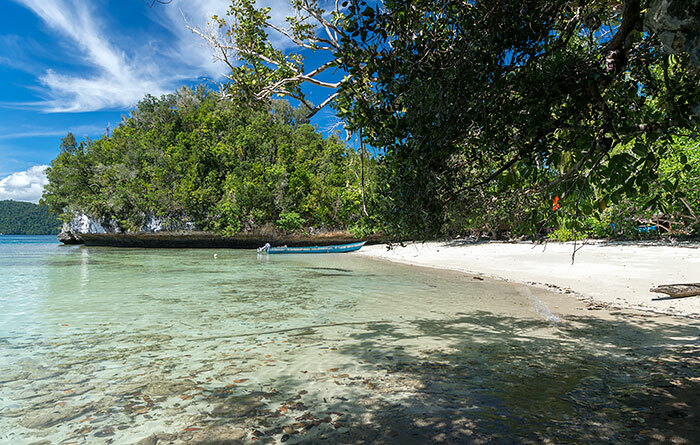 Coral outcrops amid a sand bottom around the island provide good snorkelling from the homestay beach (bring your own snorkelling equipment). 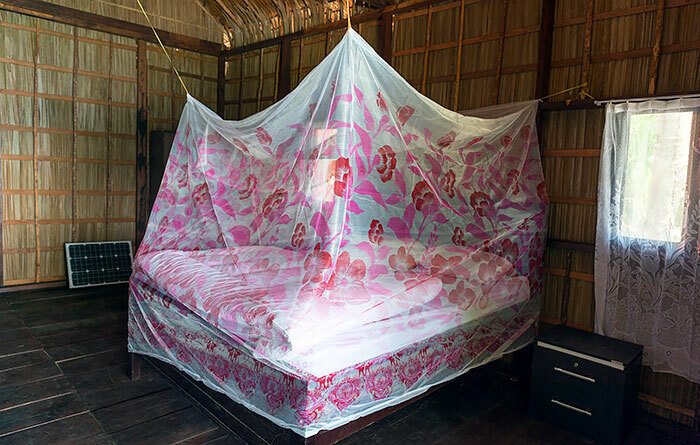 Beautiful and secluded location, 4G signal, nice bungalow, great and abundant food, but… make sure you tuck the net well under your mattress, because there are cockroaches and spiders. Also, I wasn’t happy when I was charged 450, 000 Rp in the end instead of 400, 000 as advertised here. Thanks for taking the time to leave reviews Petar – they are really helpful and appreciated. We’re disappointed to hear that Yensrai Star have apparently increased their prices without telling us and will be investigating that issue. Guests are well within their rights to refuse to pay more than is advertised on the website: Doing so will hopefully encourage homestay owners to be more diligent about passing on advice of price changes and other developments at their establishments! 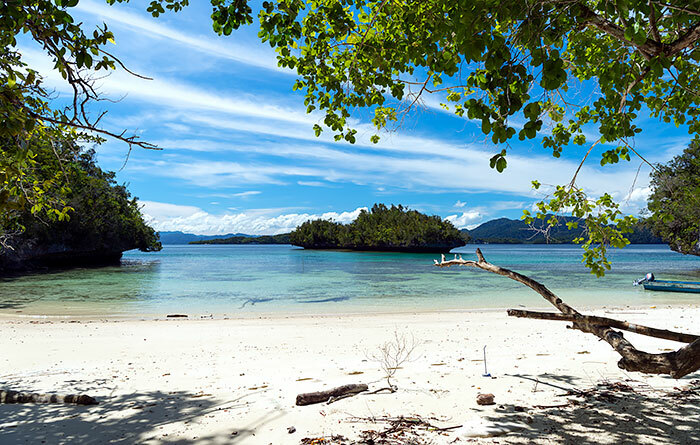 Your own private island tucked away and sheltered. 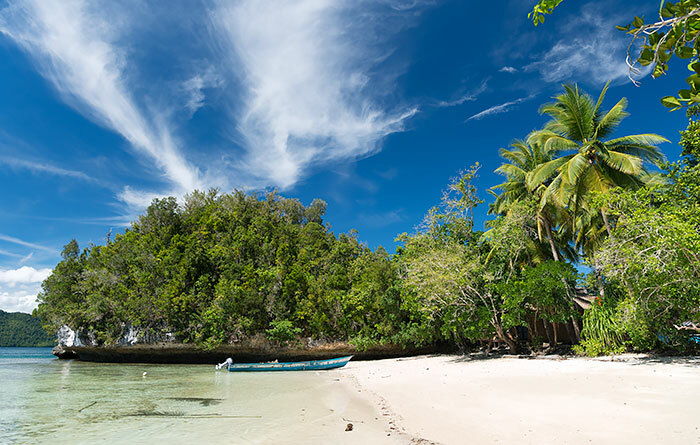 A great location to explore Raja Ampat or just stay on the island, eat the delicious food, be looked after by the lovely hosts and swim along the reef. The reef is now protected against fishing and anchoring and there’s a hidden saltwater lake, so lots to see :). Highly recommended. We stayed at this loveley private place in November for 3 nights and had a great Time! 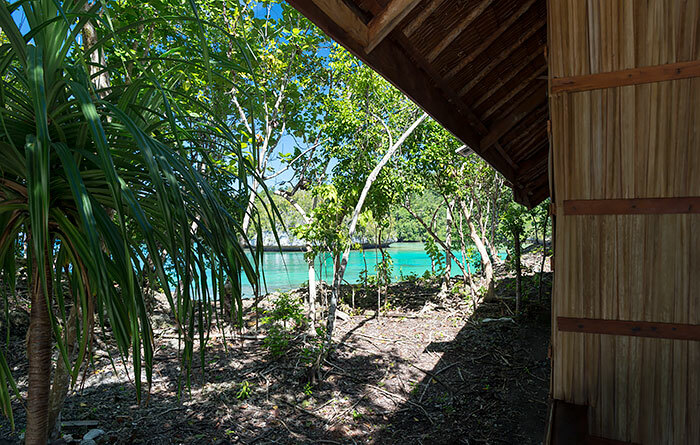 Behind the hut is a bank from where you can watch sharks passing by!!! The family is really nice and trying their best to make youre stay as good as possible! Unfortunately there were too many croachs living in the roof of the hut. We still would recommend this place!